Make the marinade:squeeze the lime or lemon Juice into a large bowl and mix in the honey, chopped chilli and olive oil, until the mixture is well blended and smooth. Bone and skin the chicken breasts and cut the flesh into large chunks. Add to the marinade and stir gently until thoroughly coated. Cover and refrigerate for at least 1 hour. Thread the chicken on to wooden skewers and brush with the marinade. Place under a preheated hot grill or cook on a barbecue, turning occasionally, until the chicken is cooked, tender and golden brown. Brush the kebabs with more marinade if necessary. Meanwhile, make the avocado sauce: blend the olive oil and vinegar together in a bowl and then beat in the mashed avocado until thick and smooth. Stir in the chopped tomato and scallions, and then the sour cream. 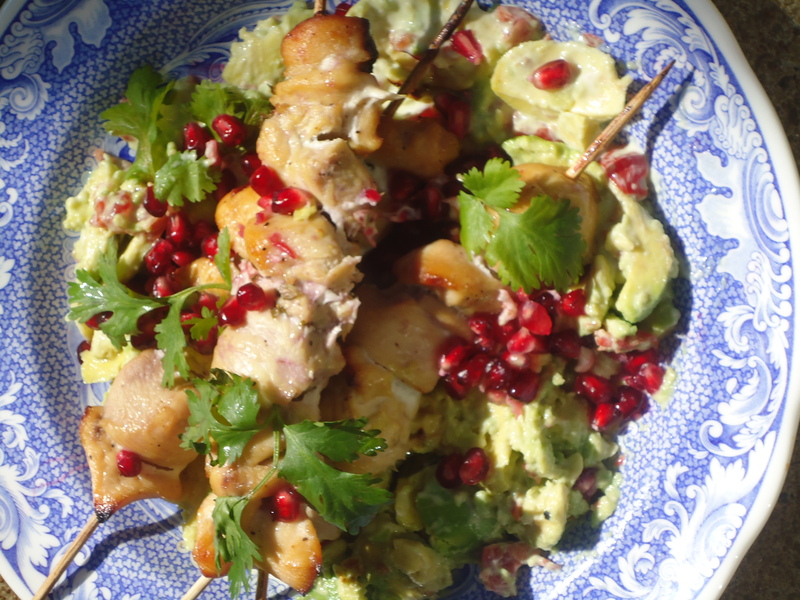 Serve the kebobs accompanied by a mound of avocado sauce, scattered with pomegranate seeds.